Here are today’s Xbox Live Arcade releases. 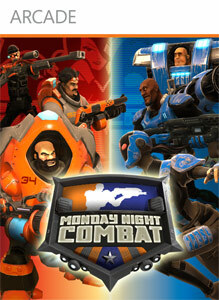 (ONLINE INTERACTIONS NOT RATED BY THE ESRB) Monday Night Combat for Xbox LIVE Arcade is a class-based, third-person shooter…and the most lethal sport of the future! It blends combat, finishing moves, gameshow-like challenges and rewards. The game features grapple moves, upgradable skills and a deep meta-game. Blitz mode pits 1 to 2 players on a split screen or up to 4 players over Xbox LIVE against waves of robot armies. In Crossfire mode, players play competitively, 6 versus 6, to destroy the enemy’s Money Ball while protecting theirs aided by robots. Enjoy an extensive Career Mode that lets players to use their money to customize classes and show off their accomplishments with hundreds of new ProTags. There are no refunds for this item. For more information, see www.xbox.com/live/accounts.